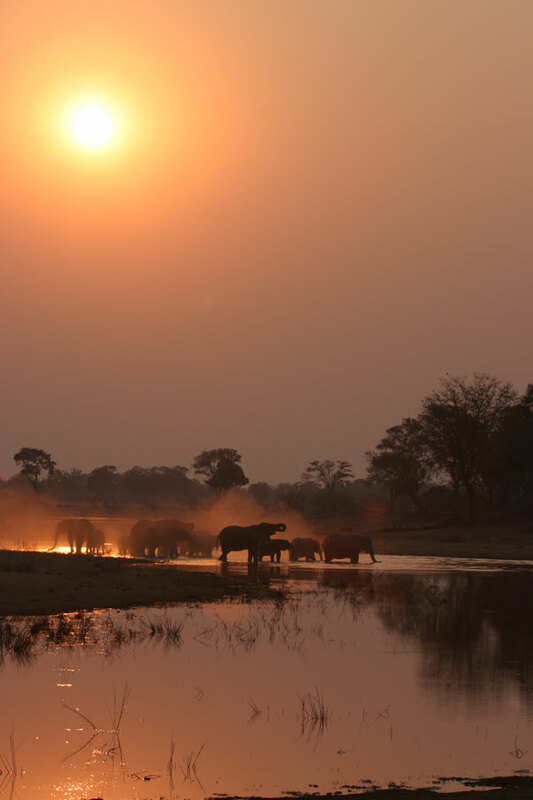 Here we can highlight Safaritalk members most memorable images: favourite photographs, taken anywhere in Africa, India or elsewhere on your travels: wildlife, landscapes, people, architecture etc. Comments invited. Please include brief details: where taken, equipment etc. A few more details please. Is there a story behind this image? Why did you want to climb Kili? A few friends of mine have said that they were too exhausted to even bother removing the lens cap after a certain height of the climb. Did you suffer from the same lethagy? Hi Geoff: if you have a few minutes to spare... here is the trip report: "A week climbing Kilimanjaro"
The peak is Mawenzi, with my wife framed in front, taken at arrival at the last camp before the summit. For other photos from the climb have a look at my album here. Decided to do Kili because I didn't have the time, money or experience to do Everest. Took the Machame route up so acclimatization wasn't that bad, and took both a point and shoot Canon digital and trust old Nikon FM2N. Selinda spillway (The Basin) Aug, 2005. John will remember this sighting as one of his images was sold for the cover of a book. Well I heard about this site through Facebook so something must be working. 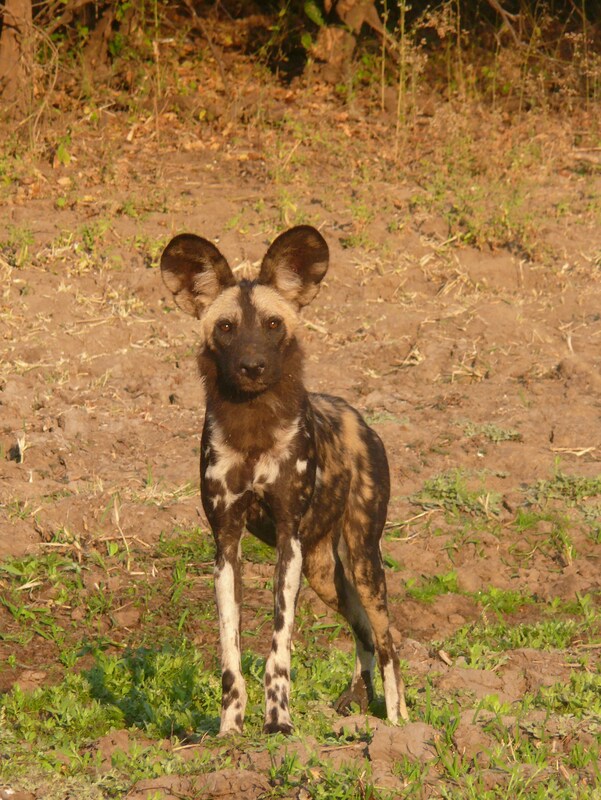 Here is a pic of a Wild Dog I saw in Mana Pools, Zimbabwe a few weeks ago. We tracked the pack on foot (minus a guide - for those of you who don't know you can do this in Mana) for about 3 Ks but they didn't settle so gave up eventually. The pack had just killed an impala. It's the third time I've run into these animals in the wild so I count myself very lucky: once in the Okavango Delta, once in Hluhluwe (SA) and most recently in Mana. Welcome white stork, thanks for linking through from Facebook. 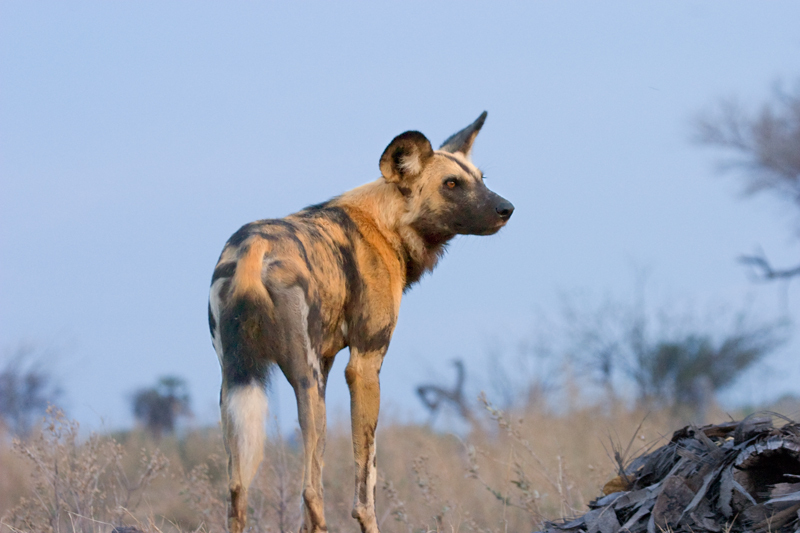 Wild dogs are very special, and members of Safaritalk recently raised over a thousand dollars to finance anti snare collars for the Painted Dog Project (Zimbabwe). It can be seen here. You can also open your own photo album on Safaritalk if you wish to host images here. Look forward to seeing more of your work and posts. Nice pic of one of the boys - From memory the third guy died later in the same year - 2005? I hope to see the new coalition of three when I get there end of September. 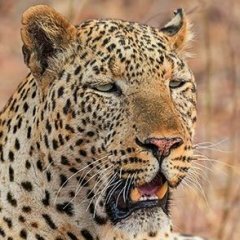 There are couple members who write at the other forum who are on safari right now - between Lebala, Savuti and Selinda. I will be keen to read as to what they are seeing. I presume we are into week 2... Up to and including Sunday 03 August. In keeping with white stork's wilddog image. Here is a sight not many people would have seen. Wildog pups inside the den. Apologies for the blown out white bit along the bottom edge. Interesting how many people state how lucky they are to see these animals. I've seen wilddog on every safari since 1998. If you've been in the Linyanti in the last 10 years I'd say you're unlucky not to have seen them. Den site was just off the transit route not far from the old Zib camp. Here is a sight not many people would have seen. Wildog pups inside the den. That was a memorable trip for wild dogs for us, Geoff...also for lion, cheetah & others. My wild dog strike rate from 1998-2008 inclusive is 50%, and I didn't really expect to see them this year...so make that 60%. 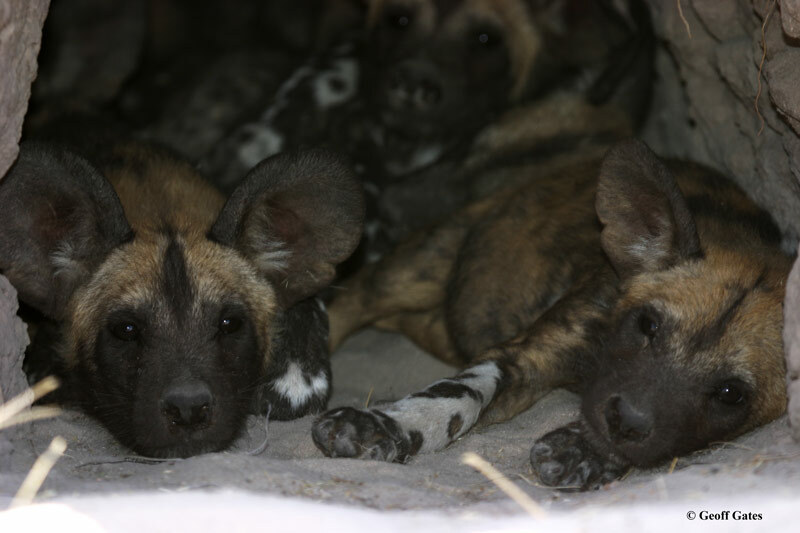 I never did understand why many people ignored advice that the Linyanti region (Selinda, Kwando & Linyanti) was one of the best for wild dogs, and went elsewhere instead. Taken at Kwando Lagoon, the dog is affectionately know as terminator. As of March 2008, broke off with two females to form a new pack in the area. John the scops owl shot is almost like in 3D. Agree with Ken, very nice indeed. The level of members skill is incredible and I love to see examples of everyone's work. Russell, did you pan the shot as the wild dog was moving? The running wild dog is a very good photo. Great capture John, I am always impressed with your flash work. I tend to not take many a photo after dark! The level of skill is incredible and I love to see examples of everyone's work. Thanks DikDik.......I had been trying to a good predator pan shot for a while. That is a very nice shot in difficult circumstances. We went to Zib 7 times and missed the Dogs on two ocassions which is not bad as we were only there once in denning season. As for Kwando it took us until our 24th game drive to see the Lagoon pack (now that is bad luck), but we have certainly made up for it since. Lets hope all of the break up packs prosper I am all for more Wid Dogs this view is not probably shared by the Impalla. Here is an old one of the Alpha Female from the breakaway pack in 2003, sadly these 4 did not survive. How did you get such a low point of view on this shot? Such a good point. Something so effective and difficult to achieve. I thought the same of the photo of johns Elephant stretching to the tree in in the other post. Still looking for the ultimate Kudu picture, I saw one on the cover of the farmers weekly. It looks like the photographer was tramped on by the Kudu. Maasai woman and child taken through gate of their boma. Tanzania, Canon digital zoom set on automatic. Week three, up to and including 10th August. Before we flew to Zambia, we did the tourist thing and spent a couple of days admiring the scenery in the Blyde River Canyon area of South Africa. The idea was to break the long journey from Adelaide so we didn't arrive flattened in SLNP. The Luangwa River from the air, on the decent back into Tafika. Here's my early morning shot taken from Kili's summit overlooking the crater into the sunrise. Point and shoot Canon digital zoom, and yes the batteries were still okay after a night climb and freezing temps.